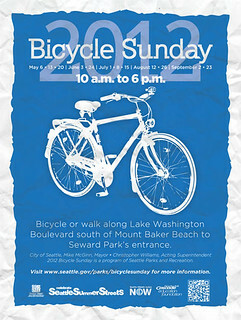 It seems almost too good to be true for Seattle area bicyclists. 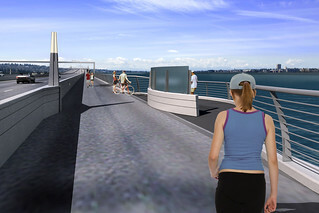 The new Highway 520 bridge across Lake Washington will have bicycle and pedestrians lanes. These artists’ renderings prove it. The Washington Department of Transportation posted the future views of the bridge at its flickr.com account last week. Although I knew that advocates from Cascade Bicycle Club and the Bicycle Alliance of Washington pushed for a bike trail on the new bridge, seeing these views somehow makes it all the more real. Is your college campus bicycle friendly? Picking up the NCAA March Madness theme, the League of American Bicyclists has announced the latest additions to its list of Bicycle Friendly Universities. The League added 5 colleges each to the Silver and Bronze rankings, raising the number of bike friendly campuses to 35 in 21 states. Heavy road traffic in North Dakota’s “drill baby drill” region is forcing Adventure Cycling Association to relocate two established bicycle routes and issue new replacementent maps. 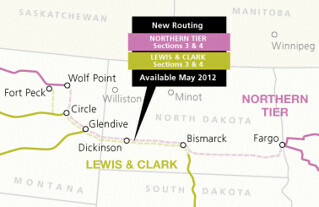 The Northern Tier and Lewis & Clark bicycle routes were redrawn to avoid the heavy traffic related to the oil and gas industry surge in northwestern North Dakota and moved southward generally to the Interstate 94 corridor. The non-profit has been dealing with the issue for at least four years. …. 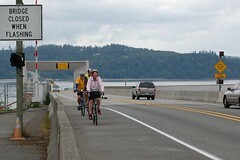 Washington state bicycling advocates are facing a March 30 (Friday) deadline to convince the state to make some safety improvements to the Hood Canal Bridge (left). The Bicycle Alliance of Washington (BAW) is asking cyclists to contact state Department of Transportation officials to get moving on the project. Although replaced in 2009, the bridge that links the Kitsap and Olympic peninsulas still needs an estimated $1.8 million in work to make it safer for bicycles. Before reaching first-name-only cult status as a pro baseball player, Ichiro Suzuki was just another kid riding his bicycle to school. But unlike the fate of most of those kids’ bikes, Ichiro’s bicycle is on display in the four-story Ichiro Museum his parents own and operate in Toyoyama, Japan. Sad news from the Death Valley National Park today. The San Francisco cyclist who disappeared from a bike tour gathering at a campground last week had been found dead. Rescuers found the body of George Kohler, 67, in the northern area of the park between the Mesquite Campground and Scotty’s Castle. Bienvenue dans le Maine. Profitez de votre balada a velo! These words — Welcome to Maine. Enjoy your bike ride! — might be uttered many times as Vélo Québec brings a bicycle tour with some 2,000 cyclists to the state in 2013. 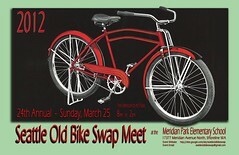 The Maine Department of Economic and Community Development announced the non-profit bicycling association is coming to Maine for a week in 2013 for its 20th annual Grand Tour Desjardins. The bicycle tour is expected to be a big economic windfall for the state. The cyclists will stop in many of Maine’s small towns clamoring for food, entertainment and lodging …. Who helped lead the way last year to put more bicyclists on the road and create a safer environment for them? The Alliance for Biking and Walking recognized seven people, groups and corporations in its 2012 Advocacy Awards released Tuesday. It’s a worthy list, and I don’t envy the task of narrowing the huge list of people working to improve bicycling conditions in the U.S. to just these few. They were honored at the National Bike Summit ….